The good folks at the City of Kingman, Josh Noble, the tourism director, Ray Cullison and the Kingsmen, and the volunteers who labored so hard to make the recent Best of the West on 66 Festival a success deserve a hearty thank you. It was a delightful and fun filled event that my dearest friend and I enjoyed immensely. Even better, it was an event that was shared with, and enjoyed by friends from the Netherlands. Though the event evolved from the rather successful 2014 Route 66 International Festival, it has some rather interesting roots. Somewhere along the line, the miners contests fell by the wayside. The name was changed to Andy Devine Days, an honorarium for the towns’ favorite son and the name sake for the Route 66 corridor through town. Still, the Best of the West of 66 Festival preserves the spirit of the original celebration, and the sense of community noted by Rittenhouse is highlighted. Political squabbles are given a rest as the mayor and mayoral candidate participate in the parade that courses through an historic business district lined with spectators, and cowboys, now mostly professionals, still kick up the dust at the Mohave County Fairgrounds. With the Route 66 International Festival that had the theme of Kingman: Crossroads of the Past and Future, a new dimension was added. In partnership with the Historic Electric Vehicle Foundation, the world’s first electric vehicle museum was established. Also, a Route 66 Walk of Fame to honor the people that have contributed to the transformation of this highway into an icon was unveiled. At the festival in 2014, the international nature of the Route 66 community in the 21st century was on display at an historic and unprecedented conference that featured representatives from several European Route 66 associations. This year it was the grand marshals, Dries and Marion Bessels of the Dutch Route 66 Walk of Fame and inductees into the walk of fame in 2015.
https://player.vimeo.com/video/184253221?byline=0&portrait=0 Best of the West Parade Kingman, Arizona from Route 66 Experience on Vimeo. Frank Kocevar, developer of the Route 66 Experience website did a masterful job of capturing the historic event on video. The Best of the West on 66 Festival was but one manifestation of how Kingman, Arizona was transformed by the 2014 Route 66 International Festival. The long dormant Route 66 Association of Kingman was reactivated shortly after that event, and has become a leader in historic district revitalization initiatives, in the fostering of a sense of community purpose, the marketing of Kingman internationally, and an array of beautification projects. As examples, in partnership with the local True Value store, the Hualapai Tribe, and Legacy Signs, the organization launched an ongoing graffiti clean up program, a mural program, and neon sign restoration program. They have also contributed signs for organizations and businesses such as Luv of Paws and Route 66 Car Wash. In partnership with the Graves family, the facade renovation at the Old Trails Garage, a current project, is generating tremendous international interest. 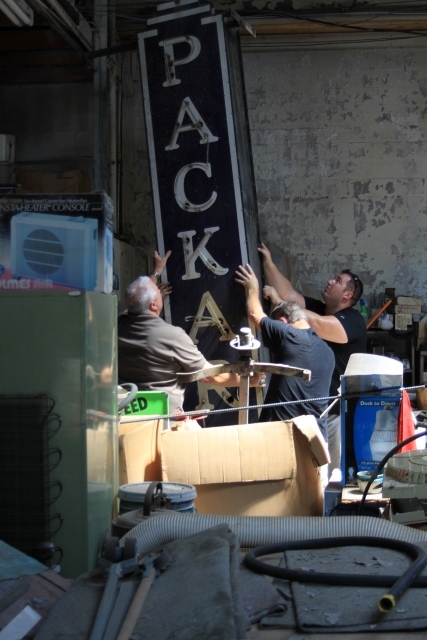 In large part this is resultant of the recovery and restoration of a towering circa 1930 neon lit Packard sign that hasn’t seen the sun since the 1940’s. The lighting of this sign will surely serve as a catalyst for revitalization a block that is at the heart of the historic business district.